I recently picked up a copy of the Pathfinder Beginner Box. I’ve been curious about this product for a while as a sort of rules-lite version of Third Edition, perhaps also playable as a complete game (a sort of E5). The very positive reviews from many parts of the OSR have also played no small part (for examples, see OD&D Discussion here, Babbling Bane here, and Tenkar here). My exposure to Third Edition is very spotty. I missed the 3E years almost entirely. So this is also a more systematic and thorough introduction to the 3E lineage for me. In this post, I will focus on my initial impressions and on the contents of the Hero’s Handbook (the player facing part of the rules). 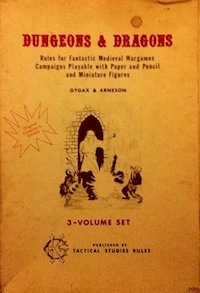 Most of this will be from the perspective of someone who already knows how to play tabletop RPGs and just wants to use the rules, but I will also note in passing that this might be the best introductory set for a new player as well (up there with Mentzer Basic D&D and the LotFP Grindhouse Edition). The visuals are not bad. I’m not a huge Wayne Reynolds fan, but I like the level of detail in some of his illustrations, and his work for the box cover is quite good (the two adventurers facing off against the black dragon). I’m also fond of the example fighter picture. Valeros looks like a badass, but is still grounded in reality. In terms of game aesthetics, the overall effect is reasonable. The heavily stylized “dungeon punk” look is subdued, though there is a bit of a fantasy seventeenth century vibe. 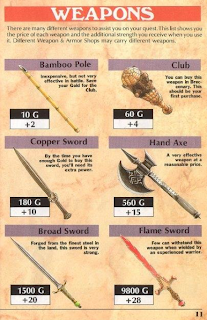 There is only one silly fantasy weapon (the starknife, which is sort of like an oversized shuriken with a handle in the middle so that it can either be wielded as a melee weapon or thrown). The graphic design is reminiscent of a video game manual, and somewhat surprisingly that is a positive thing. I remember paging through the strategy guides for early Dragon Warrior and Final Fantasy games and using them as inspiration for my tabletop games. It is that feeling that I get looking through the Beginner Box manuals. I really like how the class descriptions and spells are presented in “level-up” blocks, but the power inflation is notable in comparison to TSR editions. Each class has a few extra goodies (like the wizard’s “arcane bond” feature which gives the character a magic item that allows casting one spell per day without preparation). Hit dice are d10 (fighter), d8 (cleric and rogue), and d6 (wizard). (People can’t seem to stop bumping the thief’s hit die up.) Full HP are granted at first level. In terms of complexity, the caster classes take up 6 pages each (this includes all spells available for the levels covered) and the fighter and rogue take up two pages each (though half the fighter class is hidden in the section on feats and half the rogue class is hidden in the section on skills). In general, this feels manageable and flexible. This level of power advancement is not a problem if you top out at 5th level. Both of the caster classes are unfortunately a bit bland, and not in an the archetypal “imagination fuel” way. The available wizard schools are universalist, evocation, and illusion (boring) and each grant a few extra powers usable several times per day (for example, the illusionist can use a magical disguise once per day and the evocation specialist gets a free daily burning hands and some force missiles). Cleric “orisons” (that is, at-will powers), include light, read magic, and detect magic. That’s right, as long as you have a cleric, you never need to worry about light sources. Wizard cantrips (at-will powers, in Pathfinder), include detect magic, mage hand (minor telekinesis), ray of frost (1d3 damage with 30 foot range), and read magic. This is a bit more than I would like characters to begin with, but I can work with it. The augury spell (available to clerics at third level) is an abomination and should be excised. The fighter, wizard, and rogue are all recognizable takes on the traditional classes, though the rogue is significantly more combat-focused. The cleric, however, bears less relation to the traditional mace-wielding undead-smiting holy warrior. This seems like a strange choice for an introductory set. None of the gods resonate with me; they all seem like generic invented fantasy gods. Demihumans keep getting bigger and bigger! Dwarves are described as on average about a foot shorter than humans. So, dwarves must be around 4½ to 5½ feet tall. That is much larger than I have ever pictured dwarves in a fantasy world. And elves are described as taller than humans. There’s nothing really wrong with these changes, I just think they are odd choices for default archetypal fantasy races. These are minor aesthetic details, but still worth noting. The overall impression I get from the Beginner Box is that the system is tractable, and this is a very good thing. It seems like it would be possible to understand relatively completely without an obscene time investment. Character generation, though still more complicated than I would like, is not too cumbersome. As Zenopus says, the Pathfinder Beginner Box really is an homage to the classic basic sets, and it includes many nods to the style of traditional D&D as well, though many of them are contained in the Game Master’s Guide and so will be covered in another post. This entry was posted in Reviews and tagged Pathfinder on April 19, 2012 by Necropraxis. Fair enough review, and I think it echoes my feelings on the set as well. I run an Mentzer/RC game for my daughter and her friends, and they also play a 4e game without me. When she wanted to run something, I thought the BB would be a great way for her to learn a game that had a bit more crunch to keep her middle school friends happy so I grabbed it, also being curious about PF myself. I think you’re dead on about it being a good game, if you limit it to an E5 style. There is a great blog by Edofwar that has ALL the additional PF classes done up in BB format so you can expand the game without too much extra complexity too. Much better than wading through the massive tome that is the PF Core rulebook. That was my sense too, though I didn’t feel knowledgeable enough about 3E to really comment on it. Thanks for confirming. I know that 3E hit dice were d4 for the magic-users and d6 for the rogues, rather than the d6 and d8 used in Pathfinder, and I think the at-will type powers are also new to PF. The major differences regarding power levels that I know about between TSR D&D and 3E are that hit dice continue to accrue after ninth level and the multiclass system. The at-wills are indeed new to PF. Comparison with the d20srd‘s version is useful. PF also made a bunch of spell changes (another iteration of “let’s try to fix polymorph” being the most prominent), made magic item crafting less of a pain, and in general went with a “Give everyone more and shinier things” kind of approach across the board. I’ve been playing in a PF campaign using the BB, and the mage is really overpowered. More than a few of our combats were ended routinely by the mage firing off a battery “force missiles”. When a 1st or 2nd level character can do a guaranteed 2-5 hp damage 4-5 times per encounter, before dipping into his other spells, that’s too much power in my book. Checking the Hero’s Handbook, force missile is limited to 3 + INT uses per day, and does not require an attack roll or allow a save. It does seem a little overpowered to me, but it is a daily resource, not an encounter resource. The ray of frost cantrip is usable at will, but requires a ranged touch attack roll. Oh, and for those not familiar with Pathfinder conventions, INT refers to the intelligence modifier, not the actual ability score. Disregard that last comment, I misunderstood your reply. Anyway, we generally only have one encounter per day, so it’s effectively functioned as an encounter resource (it’s a wilderness campaign, so maybe in a dungeon delve with lots of wandering monsters it may be expended more quickly). Back then it was a cypress stick instead of a silly bamboo pole. Oh what a worthless purchase that was. 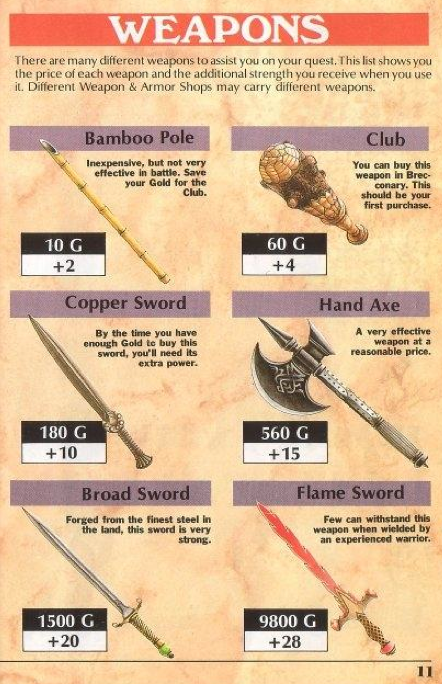 The Iron Spear though was quite a reward for such a long arduous trek to the next town. I’ve always had a passing interest in Pathfinder. I really like that they actually took steps to fix major issues (something 3.5 didn’t even aknowledge) but I haven’t played anything past a playtest for the Advanced Players guide. It’s difficult for me to even consider because I played 3.X for so long there are still plenty of things leftover in the core mechanics that grate on my nerves, especially as a DM. Still, I wouldn’t pass up an opportunity to play in it. Thanks for the review! * Wonder based on your review, as it sounds like you don’t approve, what you think about the Thief power bump, Cleric role change, and why? * Though I did have to say, after some time with BB, “This is not BECMI… but I like it.” Meaning, it wasn’t what I had hoped, but it has grown on me. Enough so, that my new blog will focus on BB E5 as a complete game. * Have to agree with Koren nRhys, EdOWar, and his blog, are a must see if one wants to expand PFBB. He is working through some OGL issues at the moment, but is fast tracking on getting everything up to snuff as far as I know. As always, great stuff, and look forward to your thoughts on the GM Guide! I think the thief power bump is probably in line with the other classes, so I don’t mind. The old sneakthief idea has been steadily transforming into the ninja or swashbuckler of the rogue for a while now. The design ethos of wanting all classes to be able to contribute equally to combat sort of necessitates this evolution, I think. And ninja-types can be fun to play too. So I suppose I am ambivalent. The Beginner Box cleric just leaves me confused. Maybe if I was more into the Pathfinder world, the gods might resonate with me, but as a generic fantasy product I don’t think they work very well. We have Vesna: a butterfly goddess of travellers, stars, and luck (what? ), Gorum: an armored god of strength and battle (why not play a fighter? ), and Sarenrae: an angel goddess of the sun and healing (and her weapon is the scimitar; again, what?). I guess Sarenrae is the closest by domain to the traditional cleric but the overall style just feels unmoored to me. Like a grab-back of arbitrary descriptors. Yeah, I agree that EdOWar’s stuff is impressive. I hope he is able to sort out the license issues. And I also look forward to your Beginner Box work too. I appreciate the response. I actually like where the Thief has gone in later versions now that I have seen them in action as a Rogue. I was more into dropping the Thief from my older BEMCI games, though I never did. I see where you would be confused with the Cleric, and not how I would have personally done a Cleric for PFBB. Maybe I will build an alternate… and from that see why you don’t particular like the gods within it for a generic setting. But it wasn’t really made for a generic setting, ie standalone. Though that is my intention to use it as. In addition, I would add that though I like the Thief to Rogue idea, I kinda miss the old Undead Van Helsing motif for a Cleric. Seems EdOWar is re-posting his Classes, Races, and Feats documents with appropriate citations! So, yay. I don’t really see how the demihuman changes are that odd, though. Elves are taller than humans in a lot of fantasy media (including Tolkien, I believe). If this is box for beginners, I don’t think they’ll find that unreasonable. Also, if dwarves are said to be a foot shorter than human, having them be 5.5 ft. tall doesn’t really square with that. A dwarf average about 4.5 ft. wouldn’t be excessive for latter D&D iterations (and would fit the real world definition of “dwarfism”). I’m not very knowledgeable about Middle-earth, but my sense is that elves are shorter in The Hobbit and taller in The Lord of the Rings. I’m probably overly influenced by TSR D&D here, to be honest. Even in 3E, this seems to have been maintained though: Elves are short and slim, standing aboout 4-½ to 5-½ feet tall and typically weighing 95 to 135 pounds … (3.5 PHB page 15). I was shocked when I found out that in 4E, dwarves were considered “medium” sized creatures. The 5½ foot example I gave was the top end of a range. Presumably, the average dwarf would be about 5 feet tall (or maybe an inch or two under, depending on what the average human height is); thus a tall dwarf would be 5½ feet tall. I picture tall dwarves to be shorter than short humans. As I said, these are minor aesthetic details. And subjective. There is no right or wrong here. I consider them surprising more than bad.